Your child is probably all hyped up when wearing a tutu dress and satin slippers. Then, why not sign up your child for ballet lessons? Your child won’t be too young or too old to learn ballet. At Music & Dance Academy, our dance program offers classes beginning at age 2. We have qualified instructors who are equally passionate about dance and teaching. There are so many things to love in learning ballet. 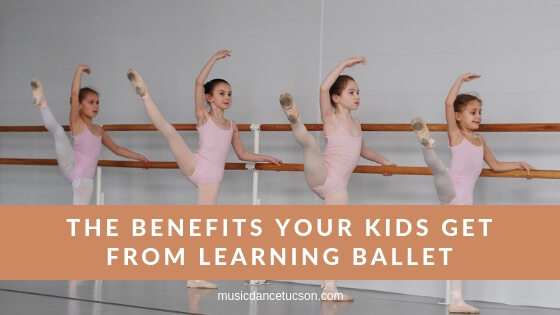 Here are some of the benefits of ballet for kids.  Ballet improves flexibility and body strength. Through the series of jumping and twisting, the heart rate speeds up so endurance and overall cardiovascular health are improved. Because of regular training, students develop their coordination and balance. Moreover, practicing ballet corrects poor spine alignment. Ballet has many physical benefits just like other forms of dance.  Enrolling your child in ballet classes is a good way for them to learn how to mingle and communicate with other kids their age. If your kid is having trouble in socializing, then making them attend classes regularly can help in overcoming their shyness. Ballet helps foster trust, teamwork, cooperation and communication.  Ballet also improves children’s mental and emotional well-being. Being able to learn ballet gives a child fulfillment and boosts self-esteem. When they master more challenging dance steps, they trust themselves more. They will be able to bring this later in their lives. Ballet training can also be an outlet for kids to relax and unwind.  Your child’s mind is also sharpened by ballet training. During training, they are able to practice how to be attentive and how to learn and memorize. This is good for your kid’s cognitive development.  Ballet can also be a good foundation if your kid is also interested in learning other forms of dance like jazz or tap.